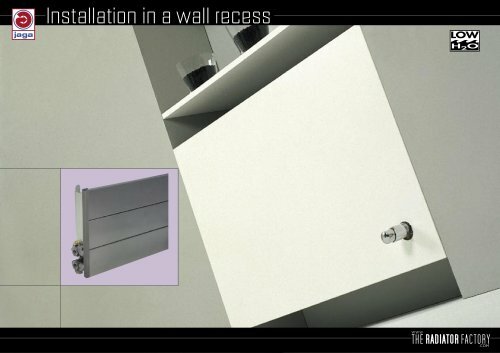 nstallatien in a wall recess INTEGRATED HEAT Jaga Low-H20 heat exchangers are extremely suitable for building in. Let your creativity take it's course and conceal your radiator in a niche, behind furniture, etc... Construct the cupboards in order to be able to open for Fit the grille a little higher than the cupboard edge. * Smaller dimensions can decrease output. Heat outputs are calculated on the given dimensions and with free outlet of 75% of dimension B. For other dimensions or grilles, correction factors have to be applied.